We all love Thai food, don’t we? Tangy, spicy, saucy—close enough to be accepted by masala-loving Indians, exotic enough to be a special meal. A flood of Thai restaurants has washed up in our cities, but surprisingly few people try the cuisine at home. 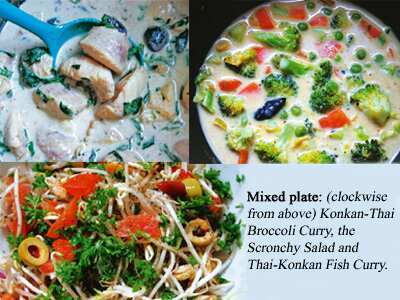 I am delighted to inform you that the flavours of Thailand merge happily with condiments from my homeland cuisine from the Konkan coast. I discovered this quite by chance more than a decade ago. It was on a cool, winter morning sometime in the late 1990s that I had time on my hands, a cold-season hunger, a limited number of ingredients—Thai and Konkan—and a desire to create something that did not taste like my everyday food. A disclaimer: I cannot tell you how to make Thai masalas from scratch. What I can tell you is that the Namjai brand of pastes works wonderfully as a base for fusion exploration. I’ve bought them for years in green, red, yellow and massaman pastes. You can, of course, simply follow the instruction on the packet and produce an adequate Thai curry, but that’s never quite satisfied me. I can get better Thai food in a restaurant. No, if you want to really make Namjai rise above its ordinariness, urge it to widen its horizons. I’ve done this often, either for my family or for parties, and the delighted response indicates it works. The fun thing is that no one is willing to believe every dish takes no more than 15 minutes. I made a fish curry (more Thai than Konkan), a vegetable curry (more Konkan than Thai) and a salad (of no specific provenance). In short, a hearty, flavour-laden Sunday lunch with minimum effort. Lightly heat 1-2 tsps of olive oil in a non-stick pan. Add the garlic. When it starts to turn brown, add the galangal. Stir for a minute, then add the green curry paste and stir-fry lightly for 1-2 minutes (if it sticks, drizzle some vinegar or wine; I use red-wine vinegar). Add the fish and toss. Reduce heat. Pour in the coconut milk. Add basil leaves. Add kokum with its water. Add salt. Simmer till fish cooks through. In a small wok, heat 1 tsp of olive oil, then pop the sesame seeds. Add garlic and cook till lightly brown. Add the galangal, stir for 30 seconds. Add the turmeric and red chilli powder. Drizzle more olive oil if needed. Add the broccoli and stir fry till almost done. Reduce flame to simmer. Add coconut milk. Add kokum with its water and salt. Stir in boiled carrot and peas. For the dressing: Juice of half a lime; 1 tsp of olive oil (less, if you want); 1 tsp of soy sauce; 1 crushed garlic pod. Dry the sprouts completely, otherwise they won’t “scronch". I used a salad spinner. Mix all the ingredients. Chill in the refrigerator. Pour on the dressing before serving. Grind some fresh black pepper on it. This is a column on easy, inventive cooking from a male perspective. Samar Halarnkar writes a blog, Our Daily Bread, at Htblogs.com. He is the managing editor of the Hindustan Times.